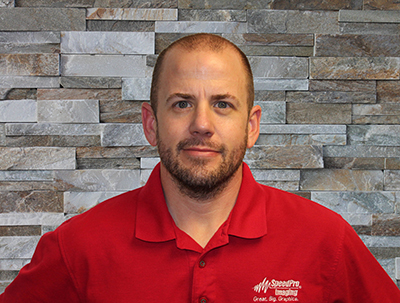 (Centennial, CO – March 7th, 2017) – SpeedPro Imaging, the nation’s leading printing and graphics franchise, recently named Drew Tefft as the company’s new Director of Operations. In that role, Tefft will oversee the business, production, sales and marketing support for SpeedPro Imaging’s rapidly expanding nationwide franchise network. Prior to joining the corporate office for the nation’s leading printing and graphics franchise, Tefft spent the past 4 ½ years with the Omaha, NE based SpeedPro Imaging franchise location. In his role as Vice President, Tefft managed the franchise’s day-to-day operations and business development, helping it become one of the top performing studios in the SpeedPro system. Tefft held several sales and management positions over 18 years in the wireless and business equipment industry before joining SpeedPro Imaging. He has also owned a wireless company and a 3D printing and prototyping business. SpeedPro Imaging’s CEO, Boris Katsnelson, says Tefft’s field experience, engaging personality, and work ethic make him a perfect fit for the position. SpeedPro Imaging has a nationwide network of 123 studios in 31 states, nearly a third of which have opened in the last three years alone. SpeedPro Imaging delivers superior display graphic products to deliver key messages and extend brand awareness on behalf of their clients. The company’s mission is to be considered the premier choice for large format graphics and exceed our client’s expectations through unmatched timeliness, professionalism, and product quality. With more than 20 years of experience, SpeedPro Imaging is the nation’s leading printing and graphics franchise – creating professional large format imaging for a wide variety of companies in any industry. The company specializes in high-quality products including wall murals, event graphics, tradeshow displays, vehicle wraps and window graphics. Through extreme resolution levels and unparalleled quality standards, SpeedPro Imaging takes visual communications to the next level. Today, there are 122 studios open and operating in 30 states, with 10 more in various stages of development.